Technology and creative sectors are surging in Moscow and housing the two is the Dominion Office Building designed by the world-renowned architect, Zaha Hadid. The exterior of the building boasts impressive protruding levels that are clad in Alucobond Plus and extend in abstract directions. 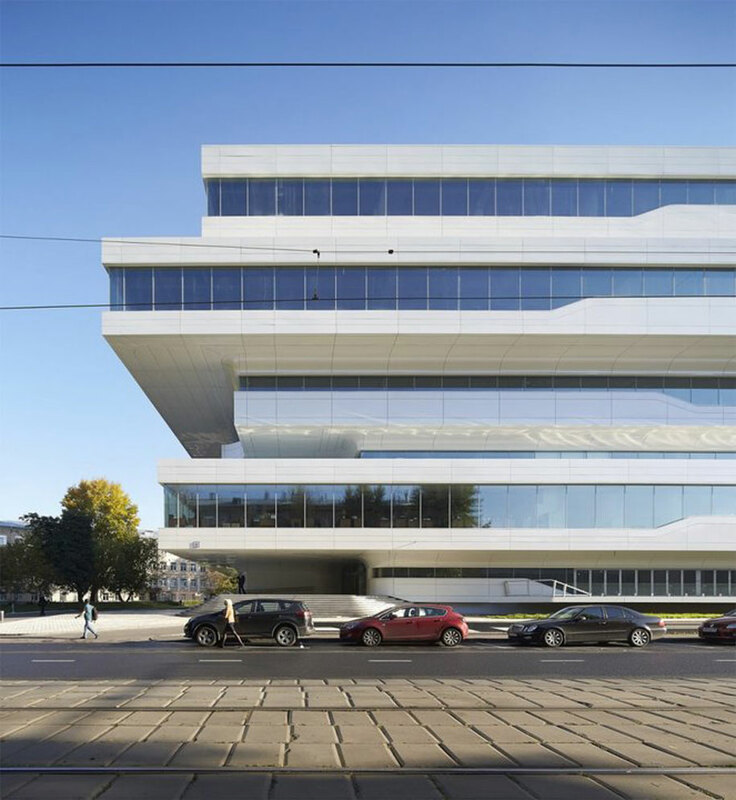 Alucobond Plus, in a custom Spectra finish, is one of the primary materials used for the exterior of the Moscow office facade, which significantly characterizes the appearance of the extruding stacked floors. 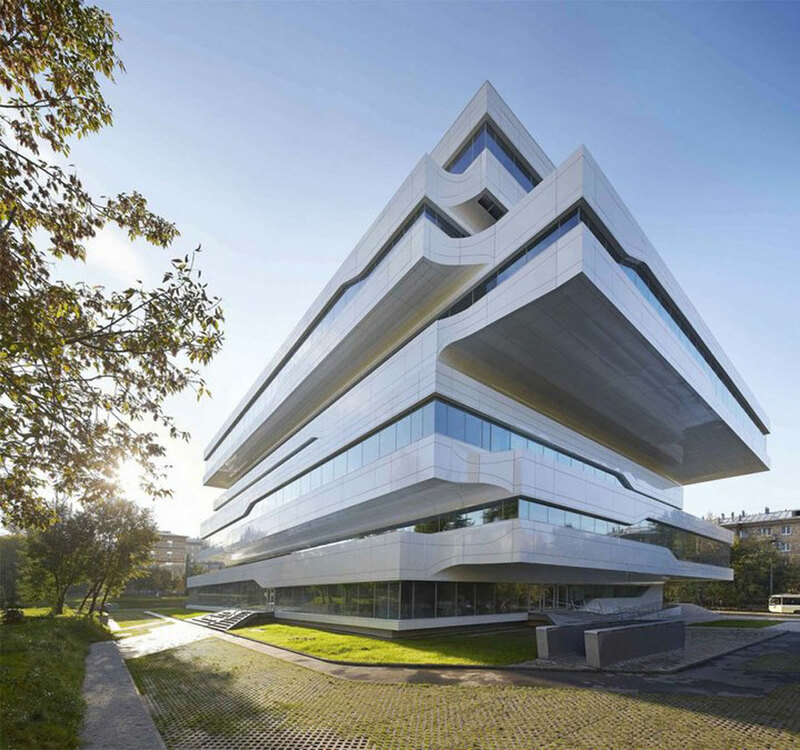 The aluminum composite material provides exceptionally flat, versatile options, making it ideal for Zaha Hadid’s visionary structure. Equally as spectacular is the interior black and white maze of floors and stairs with a central light-filled atrium. The building takes residence in the industrial district, southeast of the city. Natural light is cast onto each floor from a large open-air skylight in the ceiling. There are distinct white balconies with black finished floors at each level projecting into the center space. A series of staircases intricately interconnect throughout the main interior creating a dramatic maze effect. Conceived with the employees’ well being in mind, the atrium serves as a shared space to encourage collaboration and connectivity. There is a ground floor restaurant, outdoor terrace, and relaxation zones on the balconies to provide greater integration and comfort. Tech and creative start-up environments generally fair well with collective cultures nurtured by building design. The interaction is seen as vital for progress and development among the fields. Interestingly, office spaces are available in many different possible arrangements fit for companies based on their size small, and large. The only thing close to standard for the building design, perhaps, is the rectilinear bays that are a standard for office space. Counter to the standard, are gaps between each office space of transparent cores to allow light in from the shared atrium space. To create the uninterrupted structured floor space, columns are removed and replaced with weight transferring beams. The dramatic protruding floor plates seen from the exterior are finished with custom Alucobond Plus panels. The building is the first of many projects to be built in Moscow for the growing IT and creative markets. 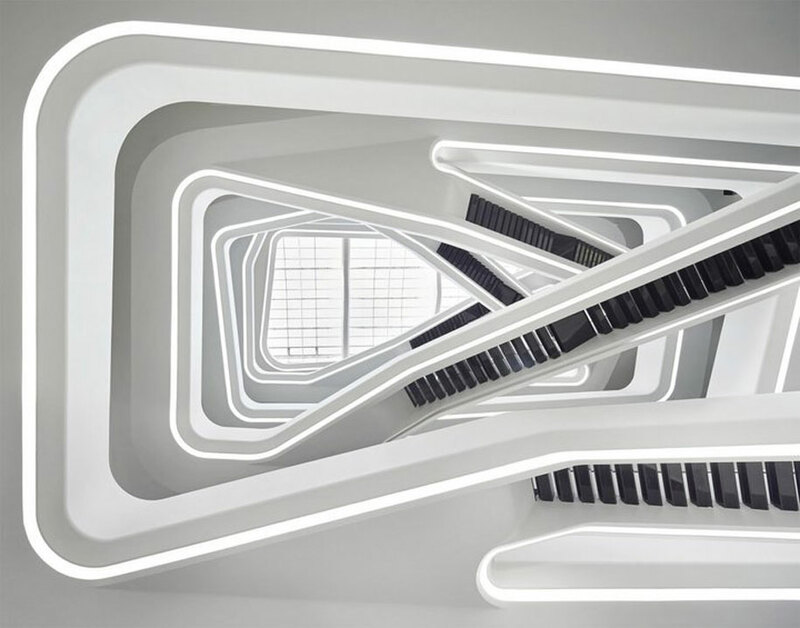 Known for her daring structures that transform corporate and cultural spaces, Zaha Hadid’s signature curves, clad in Alucobond, are evident in the Moscow office building that cuts no corners on exquisite design.